He was born in Pasto, Colombia, in 1983. He received his degree as a technologist in Electronic Automation (Universidad Mariana - Colombia), as a Systems Engineer (Universidad de Nariño - Colombia), and in Master in Intelligent Systems (University of Salamanca - Spain), in 2015, 2007 and 2010, respectively. 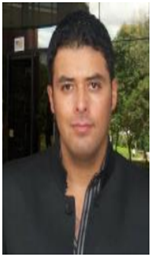 He is currently instructor at Coorporación Autónoma de Nariño - Pasto, Colombia, and PhD student at the program of computer science and mathematics of security from University Rovira i Virgili - Spain. His areas of interest are artiﬁcial intelligence, machine learning, data mining, robotics, dimension reduction, pattern recognition and visual analytics. Dimensionality reduction, data visualization, IOT, data mining. This work describes a new model for interactive data visualization followed from a dimensionality-reduction (DR)-based approach. Particularly, the mixture of the resulting spaces of DR methods is considered, which is carried out by a weighted sum. For the sake of user interaction, corresponding weighting factors are given via an intuitive colorbased interface. Also, to depict the DR outcomes while showing information about the input high-dimensional data space, the low-dimensional representations reached by the mixture is conveyed using scatter plots enhanced with an interactive data-driven visualization. In this connection, a constrained dissimilarity approach define the graph to be drawn on the scatter plot. Los enormes volúmenes de datos, generados por la actividad académica, científica, empresarial e industrial, entre muchas más, contienen información muy valiosa, lo que hace necesario desarrollar procesos y técnicas robustas, de validez científica que permitan explorar esas grandes cantidades de datos de manera óptima, con el propósito de obtener información relevante para la generación de nuevo conocimiento y toma de decisiones acertadas. La robustez y altas capacidades de procesamiento computacional de las maquinas modernas son aprovechadas por áreas como la inteligencia artificial que si se integra de forma holística con la inteligencia natural, es decir, si se combina sinérgicamente los métodos sofisticados de análisis de datos con los conocimientos, habilidades y flexibilidad de la razón humana, es posible generar conocimiento de forma más eficaz. La visualización de información propone formas eficientes de llevar los resultados generados por los algoritmos a la comprensión humana, la cual permite encontrar tendencias y patrones ocultos de forma visual, los cuales pueden formar la base de modelos predictivos que permitan a los analistas producir nuevas observaciones y consideraciones a partir de los datos existentes, mejorando el desempeño de los sistemas de aprendizaje automático, haciendo más inteligibles los resultados y mejorando la interactividad y controlabilidad por parte del usuario. This work presents a dimensionality reduction (DR) framework that enables users to perform either the selection or mixture of DR methods by means of an interactive model, here named Geo-Desic approach. Such a model consists of linear combination of kernel-based representations of DR methods, wherein the corresponding coefficients are related to coordinated latitude and longitude inside of the world map. By incorporating the Geo-Desic approach within an interface, the combination may be made easily and intuitively by users-even non-expert ones-fulfilling their criteria and needs, by just picking up points from the map. Experimental results demonstrates the usability and ability of DR methods representation of proposed approach. Spectral clustering has shown to be a powerful technique for grouping and/or rank data as well as a proper alternative for unlabeled problems. Particularly, it is a suitable alternative when dealing with pattern recognition problems involving highly hardly separable classes. Due to its versatility, applicability and feasibility, this clustering technique results appealing for many applications. Nevertheless, conventional spectral clustering approaches lack the ability to process dynamic or time-varying data. Within a spectral framework, this work presents an overview of clustering techniques as well as their extensions to dynamic data analysis. This paper reviews some recent and classical, relevant works on information visualization with a special focus on those applied to big data. The central idea dealt in this work relies on how to perform data mining tasks in a visual fashion; that is, using graphical correlation and interaction techniques. The scope of this review encompasses visualization techniques, formal visualization systems, and smart information visualization models. As well, newest approaches consisting of visualization and data mining integration process are explained. This work introduces a multiple kernel learning (MKL) approach for selecting and combining different spectral methods of dimensionality reduction (DR). From a predefined set of kernels representing conventional spectral DR methods, a generalized kernel is calculated by means of a linear combination of kernel matrices. Coefficients are estimated via a variable ranking aimed at quantifying how much each variable contributes to optimize a variance preservation criterion. All considered kernels are tested within a kernel PCA framework. The experiments are carried out over well-known real and artificial data sets. The performance of compared DR approaches is quantified by a scaled version of the average agreement rate between K-ary neighborhoods. Proposed MKL approach exploits the representation ability of every single method to reach a better embedded data for both getting more intelligible visualization and preserving the structure of data. Dimensionality reduction (DR) methods represent a suitable alternative to visualizing data. Nonetheless, most of them still lack the properties of interactivity and controllability. In this work, we propose a data visualization interface that allows for user interaction within an interactive framework. Specifically, our interface is based on a mathematic geometric model, which combines DR methods through a weighted sum. Interactivity is provided in the sense that weighting factors are given by the user via the selection of points inside a geometric surface. Then,(even non-expert) users can intuitively either select a concrete DR method or carry out a mixture of methods. Experimental results are obtained using artificial and real datasets, demonstrating the usability and applicability of our interface in DR-based data visualization. Este artigo de revisão é o resultado de pesquisa sobre a responsabilidade social, particularmente a que deve cumprir a universidade do século XXI. Evidencia a importância da relação universidade-empresa-Estado como estratégia para propiciar o desenvolvimento de pesquisa e inovação, mediante a inter-relação dos setores educativo, empresarial e governamental, a partir da qual se propende pela geração de capacidade competitiva para o avanço da ciência, da tecnologia e dos processos produtivos, que visam aumentar a produtividade para impactar o avanço da sociedade. É dividido em cinco partes: na primeira, conceitualiza-se sobre a responsabilidade social como elemento fundamental na relação empresa-sociedade; na segunda, apresenta-se a responsabilidade da universidade perante a sociedade, e assinala-se que, além de formar profissionais, tem a missão de criar e recriar conhecimento pertinente para a região; na terceira, analisa-se a responsabilidade da empresa como organização que assume processos de inovação e competitividade a partir da relação com a academia; na quarta, identifica-se a responsabilidade da universidade diante de processos de mudança com relação ao setor produtivo; em quinto lugar, descreve-se o estabelecimento das relações universidade-empresa-Estado como estratégia para instaurar cenários de confiança entre os três setores. O estudo conclui que a responsabilidade social da universidade no século XXI assume-se a partir da pertinência de suas funções substantivas com o contexto social; portanto, deve ser integrada aos âmbitos econômico, político, social, cultural e ambiental, participando deforma significativa no desenvolvimento da região e do país. This work presents an approach allowing for an interactive visualization of dimensionality reduction outcomes, which is based on an extended view of conventional homotopy. The pairwise functional followed from a simple homotopic function can be incorporated within a geometrical framework in order to yield a bi-parametric approach able to combine several kernel matrices. Therefore, the users can establish the mixture of kernels in an intuitive fashion by only varying two parameters. Our approach is tested by using kernel alternatives for conventional methods of spectral dimensional reduction such as multidimensional scalling, locally linear embedding and laplacian eigenmaps. Provided mixture represents every single dimensional reduction approach as well as helps users to find a suitable representation of embedded data. Nowadays, great amount of data is being created by several sources from academic, scientific, business and industrial activities. Such data intrinsically contains meaningful information allowing for developing techniques, and have scientific validity to explore the information thereof. In this connection, the aim of artificial intelligence (AI) is getting new knowledge to make decisions properly. AI has taken an important place in scientific and technology development communities, and recently develops computer-based processing devices for modern machines. Under the premise, the premise that the feedback provided by human reasoning-which is holistic, flexible and parallel-may enhance the data analysis, the need for the integration of natural and artificial intelligence has emerged. Such an integration makes the process of knowledge discovery more effective, providing the ability to easily find hidden trends and patterns belonging to the database predictive model. As well, allowing for new observations and considerations from beforehand known data by using both data analysis methods and knowledge and skills from human reasoning. In this work, we review main basics and recent works on artificial and natural intelligence integration in order to introduce users and researchers on this emergent field. As well, key aspects to conceptually compare them are provided. La finalidad de este texto es presentar una revisión bibliográfica de estudios en la última década sobre creatividad e innovación en la educación, particularmente, como competencias genéricas en la formación de profesionales. Es un tema de mucha relevancia puesto que la creatividad y la innovación se constituyen en competencias clave para obtener ventajas competitivas en todos los campos del conocimiento y en todos los sectores de la sociedad. La política pública sobre Universidad-Empresa-Estado, unida a la de ciencia, tecnología e innovación, llaman la atención de la universidad sobre la necesidad de profesionales creativos e innovadores responsables de la transformación de la sociedad; acción que demanda la asimilación de estas competencias en la cultura, en el contexto educativo y en el sector empresarial, estimulando el cambio de paradigma y dando paso a modelos pedagógicos cuyas bases se centran en la solución de problemas y la toma de decisiones. Big data es un nuevo concepto que emerge en respuesta a los actuales avances electrónicos e informáticos, los que han contribuido a formar montañas de datos generadas a un acelerado ritmo y que han alcanzado dimensiones exorbitantes, superando la capacidad de las herramientas convencionales para ser capturados, gestionados y procesados en un tiempo razonable. Además, dichos datos están dispersos y proceden de diversas fuentes, las cuales tienen la capacidad potencial de combinarse, propiciando composiciones inconsistentes e impredecibles. Los sistemas complejos, como la Universidad, la Empresa y el Estado, enfrentan diversos problemas, sobre los que existen gran cantidad de datos pero escasa información, lo que hace necesario dar un sentido a todo este caos, encontrando relaciones significantes para generar nuevo conocimiento. Por esta razón, las herramientas deben evolucionar paralelamente al crecimiento de los datos, haciendo emerger novedosas técnicas que utilicen las potencialidades de los recursos computacionales, como la minería de datos, y los integren de manera sinérgica con otras técnicas que se adapten a las cualidades de análisis e interpretación humana como la analítica visual, es decir, la suma de la inteligencia artificial y la inteligencia natural como un equipo idóneo para descubrir conocimiento y concebir una visión holística del mundo.